NOTATION: if you're using a mobile device to view my pictures, I don't think you can see the picture captions on VRBO. I wanted you to know that the pictures taken of the beach were all taken from the actual cottage location either from the deck or directly in front of the deck. Also VRBO price quotes are sometimes incorrect because of so many variables. Better to contact me for a price quote. 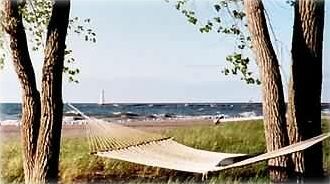 Plan a getaway vacation at this cozy cottage located on a beautiful sandy beach on the shores of Lake Ontario. Enjoy the beach and picturesque surrounding areas in the Spring, Summer or Fall while living in a charming four-bedroom bungalow in the summer resort Village of Sodus Point, New York, located halfway between Rochester and Syracuse in the Great Lakes and Finger Lakes Regions. The Village of Sodus Point has a population of about 1500 year-round residents and 5000 summer residents. The area is known for its beautiful scenery and versatile water attractions. It is a popular fishing and boating recreational area with many commercial charters available. Our cottage is on a desirable one-acre lot directly on Lake Ontario, with Sodus Bay at the south end of the street. The property is framed by a grove of mature shade trees and by beautiful sea grasses which sprout from the sand and dunes. It includes a large sandy beach front area for safe swimming, sunning, jogging, beach combing, playing volleyball, picnicking, enjoying bonfires, and viewing incredible sunsets. Bring the kites for the kids, young and old. The broad beach in front of the cottage runs for almost a mile along the shoreline. Our cottage is nestled among other private homes and is about mid-way along this length of sandy beach. The beach photos available by link were taken from the front deck. From June through September, the entire beach area is cleaned and raked most weekday mornings by town equipment. A small public beach, which has life guards on duty, is located at the far end of the sandy shoreline near the lighthouse pier and Coast Guard Station. The cottage has a large front porch with screens on three sides; windows can also be closed for comfort if desired. The porch has a comfortable dining area as well as a daybed that can sleep two overnight guests. The porch adjoins a large open deck that is right on the sand and provides panoramic views of Lake Ontario and the Sodus Point pier and lighthouse. You will feel as though you have found your own private sanctuary on a sand-kissed ocean beach. Truly priceless! The cottage is very attractive and clean, and it has been updated with all the comforts of home while still maintaining the nostalgic look of a lovely summer cottage by the beach from days gone by. It is all on one floor and has refinished wood floors throughout. It has a modern, well-equipped kitchen overlooking the beach, two baths, and three cozy bedrooms that sleep a total six guests comfortably. All bed linens and bath linens are supplied. Two bedrooms each have two twin beds, one bedroom has a double bed, and one bedroom has bunk beds with a double on the bottom and single on the top. You'll also find plenty of dresser and closet space. The great room has a dining area adjoining the living room. It has a vaulted ceiling, a heat-circulating brick fireplace, an abundance of windows, and comfortable, attractive furnishings, including a fully-equipped entertainment center. Two separate French doors open from the great room to the enclosed screened porch, which runs along the front of the cottage. The porch exits onto an over-sized deck, which is partially shaded by mature trees. Outside you will find plenty of room for outdoor dining and relaxing with an outdoor dining table and chairs, numerous beach and lounge chairs, a grill, outdoor lights, a double hammock on the beach under the trees, and your own private bonfire pit. A second large deck, which is completely sheltered from wind on three sides and was designed around a massive tree that is growing through the center of the deck, is located in the back of the house. This deck also has a picnic table and grill. The cottage has a furnace as well as a laundry room off the kitchen with a washer/dryer and a kitchen pantry. There is plenty of parking on the property with room for guests. It is a short distance to stores, shops, restaurants, live music and concerts, free outdoor movies, a lighthouse museum, marinas, boat docks and rentals, boat tours, fishing charters, a fishing pier, and parks. Many of our restaurants and shops are now open year round. You can walk to most of the village amenities. We are also close to several quaint towns as well as to farm markets, larger grocery stores, flea markets, outlet shopping, golf courses, the Erie Canal, and the Lake Ontario and Finger Lakes wine touring areas. A Fall foliage train tour leaves from the town of Sodus during September and October, and Summer and Fall boat excursions are available leaving from the Point. We are about 25 miles from the historic village of Palmyra, founding place of the Mormon Church, 45 minutes from Canandaigua's Water Park and Finger Lakes Horse Race Track, about 45 minutes from Sea Breeze Amusement and Waterpark, and 1 1/2 hours from Six Flags Darien Lake. The Waterloo Shopping Outlets and the Geneva/Seneca Lake area of the Finger Lakes with over 30 wineries are about 30 miles away. Area tourist information brochures are available on request. I would be happy to provide references from previous guests. If your dates are already taken, ask to be put on a cancellation list, or inquire about another cottage available in the same area. Cottage on 1 floor with decks accessible. Limitations: 1 entry step to house, 1 step between deck and sand. This rental was the best rental ever! The feel of this home is warm and inviting, take your shoes off and stay awhile.Clean,cozy and neat.The beds were amazingly comfortable and the master bathroom a dream. Loved the family feel of the kitchen with every gadget you could ever think of.The screened in porch with a gorgeous view of the lake was perfect for midnite talks and morning coffee. This home has a history you can see and feel and walking around inside tells you a story. We didn't want to leave and next time will book @least a week! Kudos to the owners for making this an experience we won't forget. If you want to get away to a private spot .....this is it. Cozy and comfortable for little ones and seniors as well as everyone else because it is all on one floor. On the lake and also close to the bay , some days we swin in both. Room for big family meals on back porch or deck. We love the way the dunes protect the back deck area making it private even though you are on the lake front. The sunsets are a special time when we all stop what we are doing to go out and watch our day end together. We have rented for years and Ellen has been a very gracious host. Looking forward to getting back this summer and make new family memories. There is nothing like coming into Sodus Point with this cottage as the destination! My family and I have rented from Ellen for years. Each time we have stayed, we feel at home as a part of Ellen's family. Her hospitality is unmatched, with all the little touches of home that she provides. It means so much to be able to include the dog on our vacation (we have gone through 3 separate dogs over the years bringing them with us), and the beach is wide and inviting. The cottage is set up so comfortably. Staying there has given my family wonderful memories as they have grown up and begun to raise their own families. I can always feel my stress melt away when we reach the cottage. The past two years, my husband, children and I have rented from Ellen over Columbus Day weekend. The vacation is always the break we need. Ellen is always attentive and has the comfortable,welcoming, cottage stocked with linens and towels. This makes packing easy. She has always left us snacks. She even had a toy for our beagle. My kids loved the fact that there were many games to play and joke books to read. The cottage is on a beautiful stretch of beach. There is a nice campfire pit, perfect for hot dogs and smores. The property is located within distance of fishing, hiking, apple picking, museums, vegetable stands, and wineries. The vacation can be as quiet or as busy as you wish to make it. We look forward to coming back. We have made wonderful memories at Ellen's cottage. Thank you! We had a wonderful weekend. It was our first trip to Sodus Point, will not be our last. Ellen opened the Cottage a little early so we could visit for my husbands birthday. It was cold and windy. We still had a great weekend. We used the fireplace and it kept us nice and toasty. We took our dogs and they had as much fun as we did walking the shore and bay. Thanks Ellen for the experience and opening your cottage up early for us!! !